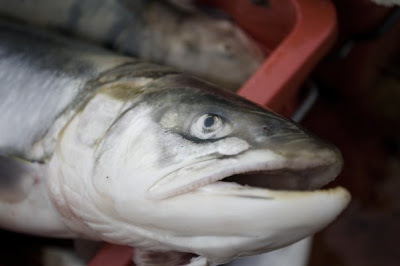 Nunavut wild Arctic char has found its way into a few DC restaurants. About mid-way through a decadent procession of 21 small courses at Volt's Table 21 a few weeks ago, a small square of vibrant pink fish, perched atop ruby quinoa, summer squash, chorizo and sherry vinaigrette, landed in front of me. The gently cooked flesh, with a flavor more subtle than salmon, was firm and blissfully buttery. Chef Bryan Voltaggio, who was cooking just 10 or so feet from the chef's table, explained that the wild Arctic char on our plates came from a remote northern region of Canada, where the fishing season only runs about eight weeks, when the ice breaks, and lasts until early September. The Inuit people there have been fishing the waters for more than two thousand years. 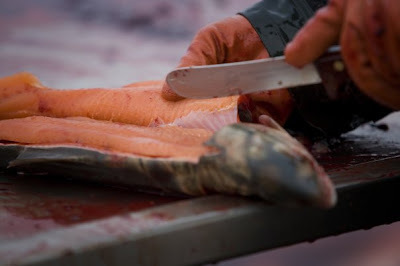 The wild char they catch are now making their way from the far-flung Nunavut region into the US market thanks to CleanFish, a San Francisco-based company that won an Eco-Ocean Award from Food & Wine last year. Voltaggio is one of a handful of DC-area chefs now serving the Nunavut char. You can also find it at BlackSalt, The Inn at Little Washington, Poste and Villa Mozart. The fish, a relative of salmon, is caught using net and trap methods. “This is one of the finest examples of artisan stewardship in wild fisheries on the planet,” said Dale Sims, co-founder and fishmonger of CleanFish, in a release. The char is not only a sustainable choice, but also a healthy one since it's packed with omega-3 oils. The catch also provides important income for the Inuit. 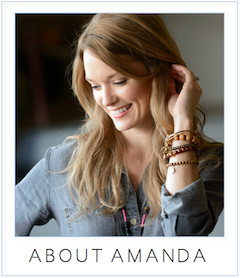 That's really interesting, Amanda. I had arctic char at Liberty Tavern not too long ago, and just saw it at Whole Foods last week - and randomly was considering picking some up for dinner tonight. Are certain types sustainable and certain types not? Is "wild" the key word? Curious. aand somehow I read over the "Nunavut" in your story, which I'm guessing is the defining factor here. But fill me in! Thanks, Missy. 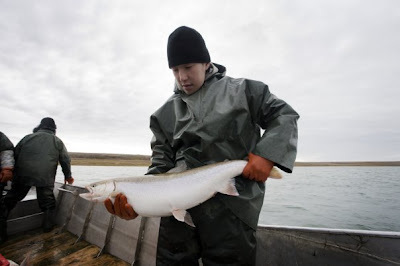 From what I know, most of the Arctic char we get is farmed - BUT the farming is usually properly managed to avoid contaminating natural eco systems. So it's also a good choice. I ate it a bunch in Iceland where they also farm it. I'm guessing char connoisseurs (like the chefs buying the fish from Nunavut) would say the wild stuff, from really cold and clean waters, is superior in flavor. The piece at Volt was really delicious. THANK YOU for posting this! I fell in love with wild arctic char while in Nunavut. Any type of arctic char is hard enough to come by... I think I'll be making a reservation one of those places this Friday. I can't wait to try the "real thing" (to me at least) again! Cool, thanks for the clarification. I ended up trying the farmed stuff yesterday from Whole Foods (I believe it was from Iceland) and wasn't a huge fan, but I'd try it again.